In this week’s bulletin, we headline with the continued action by PCS members against office closures in the Department for Work and Pensions. Also, for the 3rd time, Southern Rail management have put a divisive offer to train drivers in the dispute against Driver Only Operation (DOO). 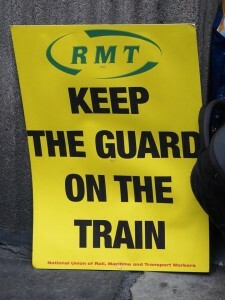 We call on ASLEF members to again reject this offer and open the way to joint action with the RMT, who have now called strikes against DOO in five train operators. Now PCS members at Plymouth Old Tree Court benefit centre have voted to strike on 6 November in protest at the plans to close the benefit centre. An overwhelming majority of members voted in favour of striking with 76.9% supporting the strike. The 230 members in the benefit centre however have been told they must relocate to another office in Plymouth. However, due to the geography and the transport connections of the area, a large number of members will not be able to relocate to the proposed new office as it is well outside reasonable daily travel from their homes. This has left a significant number of members at risk of redundancy. 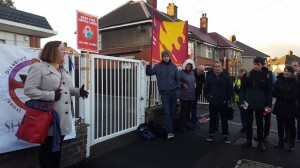 As well as these two offices, there have also been strikes at Hoylake and Whitley Bay job centres as part of the PCS DWP Group’s strategy to defend offices, jobs and public service. Send messages of support to leeds@pcs.org.uk. Donations should be sent to PCS DWP Group, 3rd floor, Town Centre House, Merrion Centre, Leeds, LS28LY. The ballot runs from Monday, 9 October to Monday, 6 November and you can vote by post, email or phone. If you have not received a ballot paper in the post or received details of how to vote online to your personal email address by 20 October you should request a replacement ballot paper by emailing balloting@pcs.org.uk. Not to book on for any shifts between 00.01 hours on Wednesday 8th November and 23.59 hours on Thursday 9th November. There was an excellent NSSN Solidarity Forum last Saturday in Birmingham. There could not be a clearer case of trade union victimisation and UVW will immediately initiate legal proceedings against both the cleaning contractor Templewood Cleaning and HR Owen at an employment tribunal and county court. We send this letter requesting your support for our campaign. If you’ve not learned of the campaign yet, we’ve included article links below. Initially, as quoted in the articles below, Cllr Chris McGuiness cited the reason for funding withdrawal from the council to South Yorkshire Women’s Aid as lack of funds due to Tory spending cuts. Since then we investigated and published proof that there was over £90 million in council reserves. This week Cllr Chris McGuiness DMBC cited this campaign as the reason that the council are not able to fund Women’s Aid! This campaign was only formed because the council withdrew funding and his comments are an attempt to drive a wedge between the supporting public and the brave staff who are speaking out about cuts. His comments are also an attempt to silence these courageous workers. These are the only front line workers who have been brave enough to go on record and publicly speak about cuts to Women’s Aid centres in the UK. This is the last Women’s Aid in South Yorkshire. It serves communities from Doncaster, Sheffield, Rotherham, Barnsley and the surrounding villages. The campaign has recieved huge support from constituents as well as Union Branches and Political Party Branches across our region and further afield. We ask that you reply with your name, trade union and any position held as a show of Solidarity and support. We the undersigned support the campaign to save the last Women’s Aid in South Yorkshire. While ever domestic violence and abuse exist in our communities, there simply must be adequate services in place to support the victims. We are aware that Women’s Aid offers support services, empowering educational courses and in addition has dedicated support worker for women from BAME community that the generic Council services in Doncaster simply don’t offer. Two women a week die at the hands of their abuser. 3 women a week take their own lives as a result of being abused. During the eight months that the service was previously closed by Doncaster Met Boring Council, 6623 cases of domestic abuse were reported to police in Doncaster alone. Domestic abuse is prevalent in Doncaster and wider South Yorkshire region. The council domestic abuse support services have suffered cuts within their own service and cannot support the sheer volume of caseloads that they are presented with. We are aware that the council’s own domestic abuse support service refers cases to South Yorkshire Womens Aid frequently, for the council to then deny any funding support to a service that they use themselves due to the inadequacy of their own service is nothing short of a shameful state of affairs. Along with campaigners we ask that Doncaster Metropolitan Borough Council reinstate funding to Doncaster South Yorkshire Womens Aid with immediate effect. We ask this for the protection and support of women and girls across the community as well as for the protection and support of our own members within the community in Doncaster and surrounding South Yorkshire region.